A HUMAN PERSPECTIVE In the 1870s, a settler described prairie land in Tazewell County, Illinois, as having western meadow lilies “as high as a boy’s head,” rippling waves of wildflowers, and grass so dense that a man on horseback 30 yards away could not be seen. At that time, the land produced crops of grains, such as corn, wheat, and oats. In most places in the world where people have settled, the land continues to be used for agricultural purposes, such as farming, herding, and timber production. Soil and vegetation have a direct impact on which of those activities the people living in a region can perform. 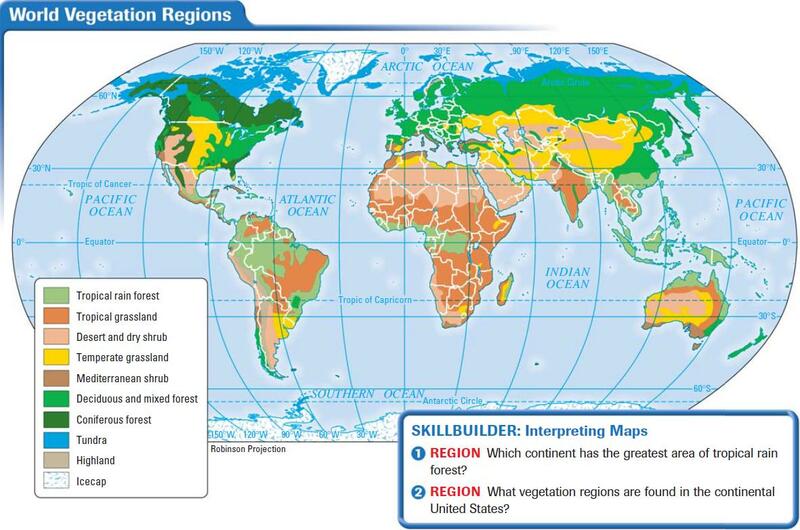 Vegetation regions are natural environments that provide the stage for human activities such as farming, raising livestock, and producing timber. Soil, temperature, and moisture influence the type of vegetation that thrives naturally in a region. Vegetation patterns are identified on the basis of the ecosystems they support. An ecosystem is an interdependent community of plants and animals. The ecosystem of a region is referred to as a biome. 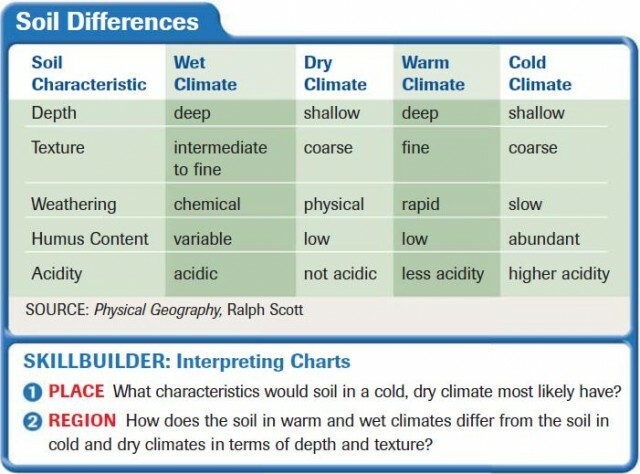 Biomes are further divided into forest, grassland, desert, and tundra. Forest regions are categorized by the types of trees they support—broadleaf or needleleaf. Broadleaf trees, such as maple, oak, birch, and cottonwood, are also called deciduous trees. The rain forest is located in the tropical zone and is covered with a heavy concentration of broadleaf trees. In the tropical rain forest region, some broadleaf trees stay green all year. In the deciduous region, trees shed their leaves at least once during the year. This region is located almost exclusively in the Northern Hemisphere. Sometimes deciduous trees are mixed with needleleaf trees, such as pine, fir, and cedar, to form a mixed forest region. Needleleaf trees are also called coniferous trees because they are cone bearing. They are found in huge stands in northern regions of North America, Asia, and Europe. Grasslands, mostly flat regions dotted with a few trees, are called by different terms. In the tropical grassland region, the flat, grassy, mostly treeless plains are called savanna. In the Northern Hemisphere, the terms steppe or prairie are used to identify temperate grasslands. Vast areas of Eurasia are covered with steppe. In the Southern Hemisphere, the temperate grasslands may be referred to as pampas. The plants that live in these extreme climates are specially adapted to tolerate the dry or cold conditions. In the tundra, plants that hug the ground, such as mosses and lichen, are best adapted to survive the cold dry climate. In the desert, plants that can conserve water and withstand heat, such as cacti, sagebrush, or other shrubs, dot the landscape. As you can imagine, the impact of human activities on soil and vegetation is immense. Throughout this book, you will read about the ways that human beings either have adapted to the land or have altered it to meet their needs. Human activities that affect the environment include building dams or irrigation systems, planting food crops, or slashing and burning the vegetation. The two photographs above show you an example of a human-environment interaction. The photograph to the left shows Glen Canyon on the Colorado River before a dam was built to create a huge lake. The lake—Lake Powell—was created to provide irrigation water, hydroelectric power, and recreational facilities. The photograph on the right shows a part of Lake Powell today. It is 186 miles long, has 1,900 miles of shoreline, and in places is 500 feet deep. As you can see, this human activity has caused changes in the environment.